Smooth Jazz Album 7 this month only $10.95! Can't get enough of the Blues? Classic Blues progressions with tempos ranging between 60 bpm - 130 bpm in 7 different keys. 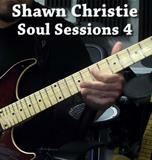 Soul Sessions Premium 5 Video Lesson now only $14.95! 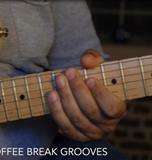 With bass grooves as smooth as silk, Coffee Break Grooves releases a new collection of inspirational tracks, designed to encourage and improve your playing, or simply jam along to. 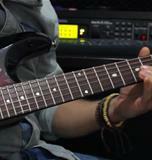 Every track has its own unique feel and chord structure, allowing you to delve further into the smooth jazz genre. 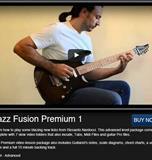 Free Video Lesson by Fabrizio Fanari! 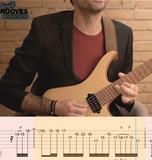 An easy way to learn how to play this awesome solo Costa Arvanitidis with animated tabs in the video! Taking it outside of the box and a little off the wall! 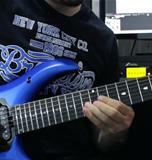 Kenny Serane solo with tabs in video! 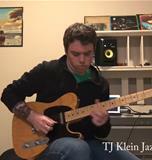 Kenny Serane soloing over a Latin Jazz track with tabs in the video! Awesome free lesson from Thomas Berglund! 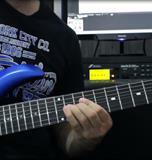 Transcriptions including tab and notation of solo sections included in the video. 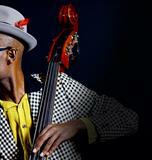 New Jam Tracks - Afro Cuban Jazz! Slide right into the groove with this exciting blend of Afro-Cuban Rhythms and jazz harmonies. Contemporary Latin Jazz with a smattering of Smooth! 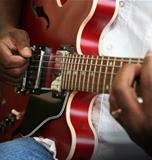 The seventh of our series of Smooth R&B guitar video lesson packages. 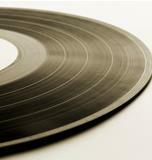 Eight (8) superb hand-picked backing tracks taken from eight of our best-selling albums! Addicted to the groove? Blame it on the Boogie! 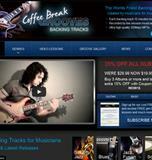 Awesome Free Licks Package by Fabrizio Fanari! Full tempo and slow tempo videos complete with tabs, notation and gp5 files. Eight new Smooth R&B tracks, perfectly crafted to deliver inspiration to your soul. Soul Sessions 5 by Shawn Christie. 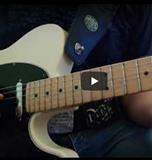 11 Slow Tempo Videos with Tabs, Scales and Chord Diagrams. A complete Performance Video of the solo. 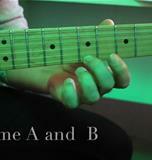 Chord chart for this backing track. The third of our series of Soul Premium lesson packages, featuring a smooth and melodic solo by Stel Andre. 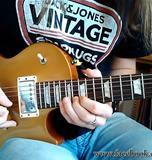 New Blues Video Guitar lesson! 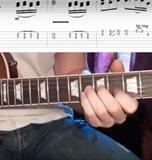 6 Slow Tempo Videos with tabs. Full tempo and slow tempo audio tracks. 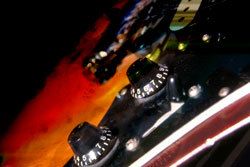 15-minute CBG audio backing track: Blues 1-3 F 132 bpm. Performance, full tempo and slow tempo video complete with tabs, notation and gp5 files. 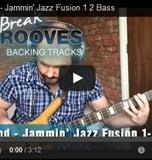 Costa Arvanitidis shows us how he plays over Jam track Soul 1-8! Complete with tabs, notation, scale diagrams, guitar pro files, chord charts and guitarist's notes. A Pocket Full of Soul! A cool selection of some of our favorite styles from this widely popular and diverse genre. 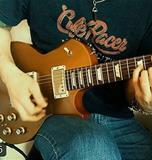 Learn how to solo over 3 awesome jam tracks! 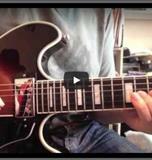 6 licks complete with tabs, notation and GPX Files. Full & slow tempo videos and audio only files. 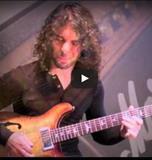 In this Free Video package Costa shows us how to play sections of his solo over Soul 5-7. Complete with tabs, slow video versions, scale diagrams and gpx files. 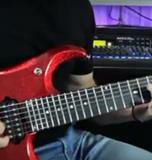 Learn 5 cool licks from Stavis Ineffable! Complete with slow tempo video, tabs, notation and GPX files. With it's hypnotic bass lines, lush keys and tight drum grooves, Soul Album 5 will have you jamming into the early hours. So turn on the low lights, grab your favorite instrument and take a trip to the smooth side. 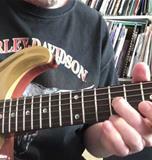 A very tasty bite size lick lesson, taken from Stel Andre's Smooth R&B Premium 6 Lesson Package! New Essential Grooves Album 4! 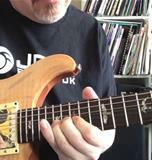 A super cool Smooth Jazz lick from the Smooth Sessions Premium 2 video lesson by Roberto Restuccia. New Album Smooth Jazz 5! A tight, funky, rhythm section meets mellow keys. 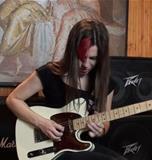 Learn how to play an awesome solo by Stel Andre! 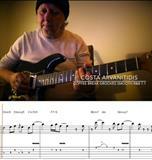 Learn how to play this awesome solo by Roberto Restuccia! 1 Performance video with Tab. 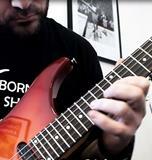 10 Slow tempo videos, all with Tabs, Scale Diagrams and Guitarist's Notes. The package also contains the full 15 minute backing track Smooth Jazz 4-3 complete with Chord Charts. Very tasty and easy to digest! 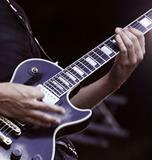 Download this cool bite sized free lick lesson from Roy Fulton, complete with tabs and guitarist's notes. 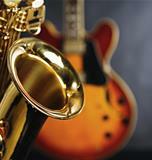 Try it out with our Smooth Jazz 4-2 jam track! Chords and licks 5&6 from Stavis Ineffable's Soul 3-6 jam. Complete with slow and full tempo videos, tabs and notation. 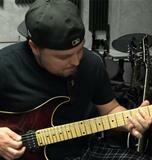 Learn two new awesome guitar licks from Stavis Ineffable! Smooth,sophisticated and right in the pocket! 8 dreamy late night grooves. Preview and download Smooth Jazz 4. 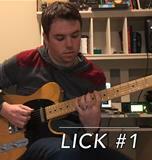 A tasty Free Lick Package from Roy Fulton - complete with tabs and guitarist's notes. 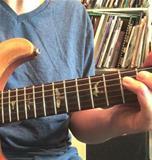 This lick is based on the notes of the A Pentatonic Minor Scale and uses a repeated Pull-Off and Slide concept to glide up the fret board. 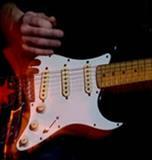 This is a neat way to change positions on the neck of your guitar in one seamless and musical phrase. 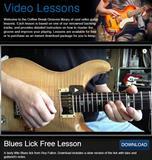 Awesome Free Licks Package by Fabrizio Fanari. 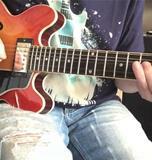 5 licks, each with slow video versions, tabs and notation. The package also contains GP5 files. 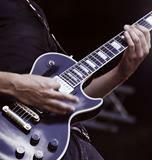 8 awesome live feel backing tracks, in need of soloists now! Grab you favorite instrument and enjoy becoming part of this world class band! 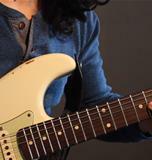 Learn how to play another awesome solo by Irene Ketikidi! 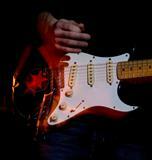 The fifth of our series of Smooth R&B Premium guitar lesson packages by Stel Andre, shows you how to play a very cool melodic solo, by providing you with an easy way to learn and master these licks and phrases at your own pace. There are a total of 7 videos in this package. 1 Performance video with tabs. 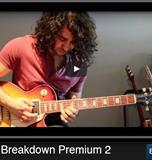 6 slow tempo videos, each with tabs, guitarist's notes and scale diagrams. The package also contains the full 15 minute backing track Smooth R&B 6-2 with chord charts. 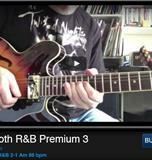 The fourth of our series of Smooth R&B Premium Video Lessons. Keeping it smooth, melodic and in the pocket. Roy Fulton not only makes it look so easy, he makes it so easy to learn! 4 Slow Tempo Video Folders, each containing 1 slow tempo video lesson and 1 slow tempo video tab. 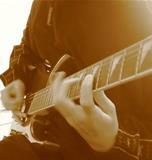 Performance Audio, Guitarist’s Notes with scale tabs, Glossary. 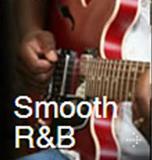 The full 15-minute CBG audio backing track Smooth R&B 5-2 Dm 65 bpm. 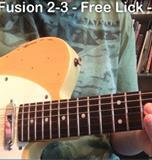 Awesome Free Licks package from TJ Klein. Complete with 2 slow videos, tabs and notation. 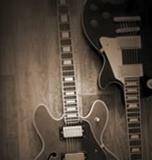 8 Laid back, exceptionally smooth, down tempo grooves, crying out for you to add your own melodies and licks! Perfect for jamming, woodshedding and trying out fresh ideas. 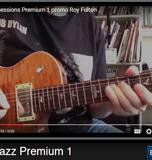 Very nice Smooth R&B free lick package from Roy Fulton, complete with a slow tempo version, tabs and guitarist's notes. It doesn't get much smoother than this! Eight Sophisticated late night grooves with plenty of space to add your own ideas, licks and melodies. Irene Ketikidi's awesome Free Jazz Fusion lick package comes complete with regular and slow tempo videos, tabs, notation and Guitar Pro 5 files. 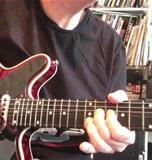 Smooth Jazz free lick package from Roy Fulton, complete with a slow tempo version, tabs and guitarist's notes. This intermediate level Premium Video Guitar Lesson from the exceptionally talented Irene Ketikidi is packed with in-depth instruction on how to play one of her awesome solos! With a total of 14 videos, Irene explains by using both front and side camera views, along with audio and written descriptions, how to master the techniques used to get her signature guitar sound and flawless style. The package also contains Notation and Tabs, Scale Diagrams, Chord Charts, Guitar Pro 5 files and our full 15-minute backing track Jazz Fusion 2-3 F 93 bpm. 8 super-smooth, sophisticated mid-tempo grooves. Tight, melodic and right in the pocket. 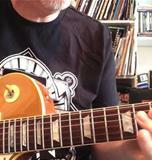 A tasty free lick package from Roy Fulton, complete with a slow tempo version, tabs and guitarist's notes. 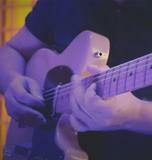 Eight easy going mid-tempo grooves perfect for jamming, woodshedding and trying out fresh ideas. Shawn Christie's awesome package starts with easy to intermediate lessons and later moves on to more advanced skill levels. getting these licks under your fingers. It doesn't get much smoother than this! Hot on the heels of our best selling Album Smooth R&B 2, we bring you Smooth R&B 3. Take some time off and lose yourself in the groove. A highly innovative approach to soloing with one of our favorite Funk backing tracks and Roy Fulton makes it so easy to learn! 3 Hybrid picking videos with tabs and simple exercises to help develop this versatile technique. Roy also included some very helpful chord voicing diagrams for Rhythm Guitar players. There are days when all you need is a little time, your favourite instrument, and a smooth groove to make it all come together beautifully. Which is why our brand new Smooth R&B Album 2 is just what you've been waiting for. Eight new tracks, perfectly crafted to deliver inspiration to your soul. Don't worry about the time, just kick back and enjoy yourself. You deserve it! 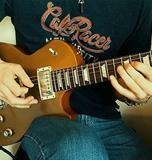 Learn a very cool lick played over our Chill 1-2 track in Dm. 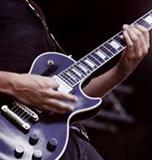 This free video lesson download comes complete with a slow version video, tabs and guitarist's notes. 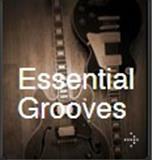 Announcing Our Exciting New Essential Grooves Album. Eight (8) superb hand picked backing tracks taken from eight of our best selling albums, lovingly assembled for you to enjoy at your leisure. The album contains world class tracks from the Smooth R&B, Blues, Chill, Soul, Jazz Fusion, Funk, Smooth Jazz and Smooth Reggae genres, perfect as a holiday gift for that special musician in your life. Download it now and give new hope to tired reindeer everywhere. 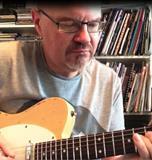 This Intermediate level Premium video guitar lesson from Roy Fulton features one of our exceptional Acid Jazz backing tracks and is designed to help you create a superb solo that you can polish and adapt for your own needs. 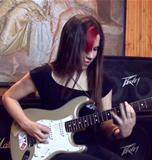 1 performance video, complete with tabs, guitarists notes, chord diagrams and tab glossary. 7 slow videos with tabs. The package also contains a full 15 minute backing track with chord charts. If you love smooth, and the bass line gets your groove, then you're going to love this unique new sound. 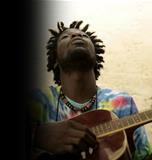 Our Smooth Reggae genre sets a whole new definition for the Groove!. Oh yes it does! 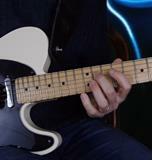 The second of our series of Smooth R&B Premium lesson packages features a beautifully crafted solo by Roberto Restuciia, broken down into easy to digest bite size chunks providing you with a simple approach to master these licks and phrases at your own pace. 8 Exceptionally smooth Brazilian grooves. 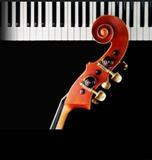 Hand played traditional percussion, full drums kits, bass guitars, upright basses, keyboards and real pianos. Slow to medium tempos ranging between 61 bpm to 128 bpm. 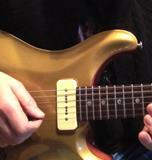 A cool Jazz Fusion lick from Roy Fulton. Download includes a slow version of the lick with tabs and guitarist's notes. 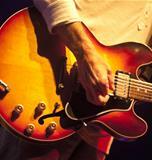 Learn how to play a superb solo with one of our favorite Smooth R&B backing tracks. This easy to learn beginner to intermediate package from Roy Fulton includes one performance video, 5 slow tempo videos with tabs and the full 15 minute backing track, Smooth R&B 1-6 E 85 bpm. 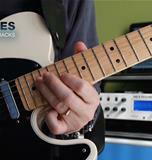 Everything you need to master these slick licks at your own pace. Acid Jazz 1 album the sound of cool brought to life in digital glory! Eight incredible, tight, slick grooves, woven from our own heady blend of Jazz and Soul elements. We dare you to just sit there and listen. Go on, try. 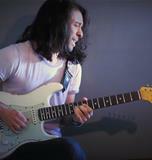 Learn how to play some blazing new licks from Riccardo Nardocci. This advanced level package comes complete with 7 slow video folders that also include, Tabs, Midi Files and Guitar Pro files. 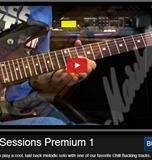 This Premium video lesson package also includes guitarist's notes, scale diagrams, chord charts, a user guide and a full 15-minute backing track. 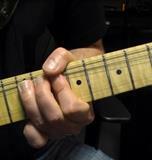 A melodic and easy to follow lesson on how to solo over one of our favorite grooves. Full tabs, chord charts and guitarist notes for each video. These tracks are fun to play over with enough rhythmic variation to keep it interesting without being over complicated. Perfect to experiment with and really rich full sounding tracks with a live vibe. 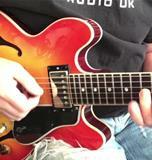 A tasty little Blues lick from Roy Fulton. Download includes a slow version of the lick with tabs and guitarist's notes. We're delighted to announce a new FREE video lesson from Ric Daude, based around our new Funk 1-3 Cm 100 bpm backing track. 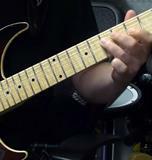 The lesson includes a standard tempo video, which transitions into slow version to help you learn the lick at your own pace. The lesson also includes a full tab with notation. You can either watch it on our Video Lesson page or download it to enjoy at your own pace. Grab it here. 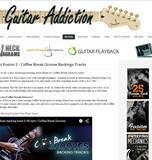 Let's face it, if you're going to get the best out of our Coffee Break Grooves backing tracks, you'll need to make sure your guitar and rig is optimally set up. We thought we'd help out by giving you a few tips on how to make sure you're getting the best sound you can, so your jams can be truly awesome! 1. Balance it baby! 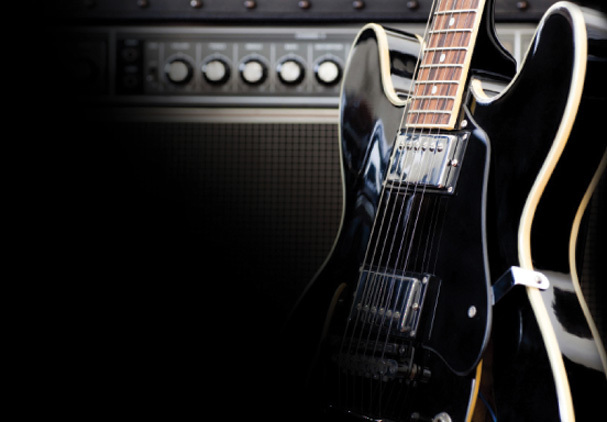 There's a hidden sweet spot between the volume control on your amp and on your guitar. So use it. 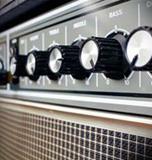 Instead of focusing on just adjusting the amp volume, try adjusting guitar and amp together in small increments. You'll find it can make a real difference. 2. Pickup and go! Pickups are the heart of any guitar sound, so it makes sense to get a handle on how to set them up properly. The height of the pickup, the type and the balance between multiple pickups on your guitar all give a distinctive flavor to your instrument. Experiment. 3. Check your cord! Believe it or not, there are differences between different qualities of guitar cords (or leads for you Brits). A good quality one can give a vastly improved sound over a cheap one, and remove interference too. 4. Keep it sweet and low! Most players insist on using Input One on their practice amp. If you have two, then try using the second one (low gain), to make your sound cleaner and more clear. 5. Don't string me along! Strings make a huge difference to your sound. Design, gauge and make can deliver a radically different tone to your instrument. Spend some time researching the strings that suit your favorite tone. 6. Pick and choose! Most guitarists spend very little time choosing a pick, and yet the sound you get with different types, weights and brands can be huge. Once again spend time exploring different products to see which you prefer. 7. Fret not, Charlie! 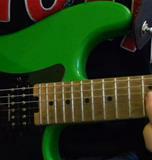 The only time most guitarists notice their frets is when they're too worn to be useful. But they can deliver more than just playing feel. 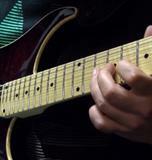 Wider frets tend to be easier to bend, while narrow ones are selected for a generally more crisp harmonic sound. 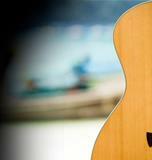 And remember to keep an eye on wear, as that is a vital component of a guitar's playability. So there you have it folks, we hope these tips really help out. In the meantime, make sure to visit your favorite genre here at coffeebreakgrooves.com and check out our range of amazing backing tracks and video lessons. And have fun! We've got some exciting stuff coming up over the coming months to keep things popping. There will be regular monthly releases of some amazing new backing tracks for you all to enjoy, as well as new video lessons. We'll also be featuring more great players in our Groove Gallery, so if you have a solo you would like featured, don't forget to drop us a line at info at cofeebreakgrooves dot com and we'll definitely take a look. We're also really excited about our growing library of backing tracks for bass players, and for drummers, which we believe is a totally unique offering. Tell your friends and share these tracks so we can continue to bring you more fresh tracks for your jams. As we say ... watch this space! 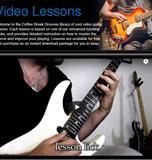 We're delighted to announce the launch of our Premium Video Guitar Lessons section, and we're starting with a bang. 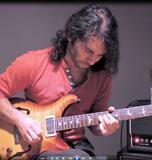 The first lesson in our catalog is a sophisticated solo jam lesson from amazing guitarist Roberto Restuccia. 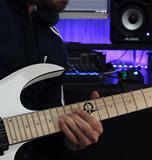 His intermediate to advanced lesson is based on a backing track from our Soul 1 Album, and comes complete with 7 performance videos, tabs, chord charts, scale diagrams and guitarist notes to put it all into context. 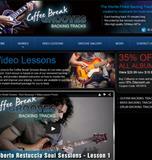 The lesson package also contains a full 15 minute backing track to let you practice and improve in your own time. The full lesson package is available as an instant download for just $19.95. Check it out here, and take your playing to a new level. Brand new website, fantastic new catalog and all the grooves you could ever wish for. We're back and better than ever! Did you miss us? We missed you! So what's new? Well you're going to love our new catalog. 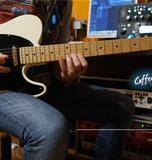 The backing tracks are richer, more immersive and genuinely groovalicious, just try them out if you don't believe us. Still 15 minutes long, still at that ultra high resolution that your headphones will adore. We've also revamped the website to make it easier to audition and buy your favourite jam tracks, and there's now also a proper video lesson section which we're going to fill out with some awesome tutorials for all skill levels. So now we're ready and waiting for your comments, advice, and friendly suggestions. Don't wait, drop in and tune out with the all new coffeebreakgrooves.com because it's Jam Time.